One of many threats to Laurel Canyon was the Menaldi plan to develop a vast swath of important open space on the north side of Laurel Canyon Boulevard, above the Canyon Store. While thre recession and an unstable hillside have halted this project, this land along with other substandard lots continue to attract greedy developers. Of course, there are many issues affecting the quality of life here in Laurel Canyon. Your Laurel Canyon Association has identified several that board members feel are of particular concern. As residential home values have skyrocketed, so has pressure to develop the remaining undeveloped lots in Laurel Canyon. Parcels that were formerly protected by the enormous cost of meeting building regulations are now considered feasible building sites. In a nation where property rights are king, what can a community do to protect badly needed open space? Buy Undeveloped Lots: If there's a vacant property adjacent or near your home, consider buying it alone or with your neighbors.You can protect the property from future development with restrictive covenants or by donating the land to The Nature Conservancy or other organizations that will hold the property in an undeveloped state. Encourage Public Purchase: If you are aware of a threatened piece of open property, you can lobby the Mountains Restoration Trust, The Nature Conservancy or The Trust For Public Land to purchase the land as permanent open space. Just over a year ago, Santa Monica Mountains’ residents from Topanga State Park to Griffith Park voted overwhelmingly to assess themselves $40 a year over the next 30 years to protect many of the last remaining open spaces in the eastern Santa Monica Mountains. The Santa Monica Mountains Open Space Initiative has made available a total of $32 million for open space acquisition, creation of additional parklands and trails, protection of wildlife corridors and brush clearance. Oppose Illegal Development: The best way to keep land undeveloped is to carefully monitor what is going on with the land in your area. The City has a bad record of granting exceptions to developers when the neighbors remain silent. If the development requires upgrading the street all the way to the nearest intersection, then hold the City to its rules. And don't be dissuaded by a Zoning Administration or Building Department ruling. There are appeal processes that will often focus greater attention on the issues. Use The Variance Process As A Tool: If a variance is requested to allow construction, think of this as an opportunity to engage the developer. Variances require public comment, and this opens the possibility of negotiation. In return for reducing building height or preserving parts of the lot, the neighbors can offer acceptance of less onerous aspects of development. The point is "be creative". Engage, negotiate. If all else fails, ask the City to abide by the rules. 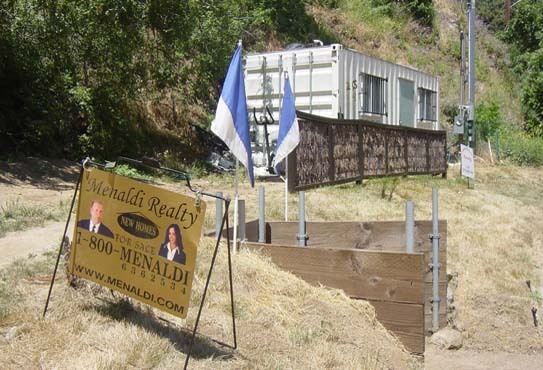 Block Access: Many lots in Laurel Canyon are effectively land-locked. In other words, the property can not be accessed by a legally wide road. You can prevent development of these lots by buying key access lots, or by denying easements, or by insisting that the City not grant exceptions to land access rules. Remember, many communities have tight development restrictions or strict hazard zoning laws, but not here. LA's frontier, any-thing-goes mentality has resulted in the river system being turned into an open sewer and greenbelts turned into sub-divisions. Only by saving lots - one at a time - can we preserve Laurel Canyon for the next generation. We've all seen the speeding drivers roaring down the hills and people barely stopping at intersections. But did you know that the LAPD reports that most of the offenders are us! Yes, most of the people driving recklessly in the Canyon are Canyon residents. So, do your part to obey traffic and parking laws. If you see someone repeatedly breaking the law, take down the license number and report it to the police. Don't confront the driver on your own. This just promotes hostility between neighbors. And keep in mind that a moving car appears to be moving much faster than it actually is to a pedestrian. If you need to get hold of our local motorcycle cop, please contact: Officer Jerry Siel, Community Traffic Services Unit, Los Angeles Police Dept., West Traffic Division, 213-473-0215. If you are one of the people mentioned in the first sentence, you may already have met him. 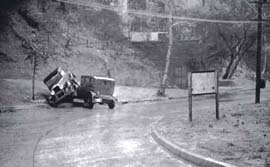 Car wreck on Laurel Canyon 1920's. The driver was probably fumbling with his cell phone. Another headache is illegal parking. Make sure your guests, workers and delivery people are not parked on the wrong side of the street or blocking a neighbor's driveway. Always make sure there is enough room for emergency vehicles to get by. Don't "store" your car on the public streets. We have little enough space for the cars that are actively used. And don't take up a spot that will fit two cars with your one car. Be respectful, and the whole Canyon benefits. Laurel Canyon was conceived and planned as a wooded vacation home retreat over a century ago. That's why many of our older streets are so narrow and why we have so many odd or substandard sized lots here. From a safety and services support point of view, Laurel Canyon was over-built years ago, but we can't completely stop new development. We can try to block the most offensive projects. We can work with builders and residents to modify others. And, we can insist that current laws be obeyed. But once construction is approved, we ask the owners and their builders to respect the neighbor's rights to peace and quiet. The following list of recommendations was written by one of our board members and serves as a code of conduct for anyone planning construction in Laurel Canyon. Limit Noise: No loud equipment before 8am and never on weekends. No loud or profane language, and no loud radios. Porta-Potties for workers at sites. And absolutely no extreme noise without prior notice and coordination with the immediate neighbors. Display Permits: All permits or copies there of should be clearly displayed at the front of the project. Fast Track: Every effort should be made to complete projects as quickly as possible. Do not begin a project unless you have a complete plan to complete it promptly. Security & Safety: All construction sites will be fenced and secured so as to be safe from traffic, pedestrians and children. No hazardous material shall be stored in such a way as to pose a public danger, and if necessary, security patrols or non-obtrusive lighting shall safe guard the site and prevent it from attracting off hours activities. Neighborhood Access: At no time during the construction process shall streets be blocked or slow moving equipment or vehicles be used without flagmen and warning devices. The flagmen’s responsibility will be to advise drivers of the delay and prevent gridlock from developing. Worker Parking: There shall be absolutely no worker or staff street parking beyond the front of the site or in such a way as to impede traffic. No stockpiling of building materials, trash containers or debris shall impede traffic or create a safety hazard. Storage: In the case where the street is of substandard width, contractor parking and stockpiling of materials shall be off street until appropriate street widening has been done. Bonding: Developer to Bond for any damage done by delivery trucks or equipment to streets and private property. Truck Size: No trucks larger than bob tails in hillside areas. Spillage: No full cement deliveries (20% light) in hillsides to keep trucks from spilling cement on sloping streets. Any spillage on streets shall immediately be cleaned up – or removed within two days of discharge. Clean-up: Builder shall sweep street adjacent to site twice a day to pick up nails, dirt and debris. Inform: Of course the best way to keep peace with the neighbors is to keep them informed. Drop a note in the mail boxes of those within a five house radius. Let them know the expected duration of your project. Inform them when expected delays or particularly noisy operations will take place. Give the neighbors a hot line to call when they have an issue. The conundrum of living in the hills is keeping brush cleared to prevent fire but keeping enough natural vegetation on the land to prevent erosion. Fire risk aside, the best and most attractive way to preserve the hills from erosion is with plant life. When your gardeners come to clear brush, instruct them not clear down to the dirt. Leave enough ground cover to re-grow before the next rainy season. Cement gunnite sprayed on crumbling hillsides has a limited life. 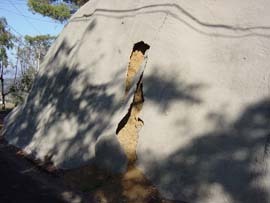 The culprit is unreinforced cuts made into hillsides for roads and driveways. Only proper grading, planting and terracing will offset the forces of gravity and water pressure. The worst solution is massive concrete retaining walls or gunnite sprayed onto hillsides. An alternative is terracing, preferably with treated wood railroad ties. For hillsides denuded by construction, degradable netting can be used to stabilize the hill until replanting grows in. Historically, the Santa Monica Mountains have been home to a rich diversity of plants and animals. Sadly, many species have been greatly reduced, and many predator species, such as foxes, mountain lions and bears, have been mostly driven out of the developed areas. But with your help, environmental balance and habitat can be saved from further deterioration. No Fences: The old adage that good fences make good neighbors doesn't apply to wildlife. Animals need access to feeding grounds and to cross competitive territories to mate. If you don't need a fence to contain your dog or protect young children, consider not building them or tearing them down once the need goes away. And if you really need a fence, consider limiting the fence to just the minimum area needed for protection. Leave connecting space between properties for animal access, and be especially aware of preserving animal trails. Try to avoid the selfish tendency to "claim" your property with a fence. No Poisons: We have lots of gophers and rats in Laurel Canyon, but poison is not the answer. It contaminates the food chain. The poisoned animals are eaten by scavengers, like hawks, which in turn are poisoned. No Attractants: Don't leave dog food or garbage out where raccoons, opossums and coyotes can get to it. This just creates human dependency and further unwanted conflicts between wildlife and people. No Exotic Species: Learn about native species and plant only those things that grow naturally in the shaded valleys and chaparral draped hills of Laurel Canyon. And get rid of those things that don't belong here, especially Australian Eucalyptus trees that are so destructive to the environment. Aside from their high flammability and their tendency to topple over during strong winds, the fragrant pitch clogs the beaks of native birds and the eucalyptus leaf litter contains a herbicide that prevents other plants from growing. No Spring Tree Trimming: Our neighborhood sits smack in the middle of the North American Flyway, a bird migration route that extends from South America to Alaska and Canada. Many of these birds as well as local species will nest in our area during the spring. So, don't schedule tree trimming in the spring and early summer without checking very carefully for nesting birds. Our strength lies in working together toward a common vision of our community's future. Only by uniting and focusing our efforts on key issues will we be able to improve the quality of life here in Laurel Canyon. This starts by joining your Laurel Canyon Association.